Mr. President, I want to give you the latest on the grave situation in Cote d’Ivoire, and I can only say that it continues to be a targeted genocide against supporters — or perceived supporters — of deposed President Laurent Gbagbo. This will be my seventh time speaking on the Senate floor about the tragedy in Cote d’Ivoire in addition to the statements I made at a hearing two weeks ago before the Senate Foreign Relations Subcommittee on Africa. And Mr. President, I have new information that proves what I have been alleging for over seven weeks: that rebel leader Alassane Ouattara is still carrying out reprisal killings by his ‘death squads’ roaming the streets of Abidjan, Cote d’Ivoire. The report goes on to describe in gruesome detail, barbaric episodes of torture and death of civilians at the hands of Ouattara’s forces. Ouattara’s Forces . . . sealed off and searched areas formerly controlled by pro-Gbagbo militia . . . and the majority of documented abuses occurred in the longtime pro-Gbagbo stronghold of Yopougon . . . . Most killings were point-blank executions of youth from ethnic groups generally aligned with Gbagbo, in what appeared to be collective punishment for these groups’ participation in Gbagbo’s militias. Mr. President, these Young Patriots were young supporters of President Gbagbo who surrounded his presidential palace in a human chain armed with only sticks and bats against UN and French attack helicopters which were bombing Gbagbo’s residence. Now they are being searched out by Ouattara’s forces for torture and death. Another woman who witnessed the killing of 18 youths . . . was brutally raped by a Republican Forces soldier after being forced to load their vehicles with pillaged goods. On May 23, an elderly man in the same neighborhood saw Republican Forces execute his son, whom they accused of being a member of pro-Gbagbo militia. Another witness described seeing the Republican Forces slit the throat of a youth in front of his father after finding a Kalashnikov and grenade in his bedroom during a 4 a.m. house-to-house search. The witness was stripped and forced to hand over his laptop computer, cell phones, and money. Human Rights Watch documented similar pillaging of scores of houses in Abidjan. The witness, like many others interviewed by Human Rights Watch, wanted to flee Abidjan to his family village, but had no money for transportation since the Republican Forces had taken everything. Human Rights Watch documented 54 extrajudicial executions at detention sites, including police stations and the GESCO oil and gas building now used as a Republican Forces base. On May 15, Human Rights Watch observed a body burning less than 30 meters from the 16th precinct police station. Several witnesses told Human Rights Watch the following day that it was the body of a captured militiaman who had been executed inside the police station grounds. In addition to killings, Human Rights Watch interviewed young men who had been detained by the Republican Forces . . . and arrested for no other apparent reason than their age and ethnic group. Nearly every former detainee described being struck repeatedly with guns, belts, rope, and fists . . . for alleged participation in the Young Patriots . . . . Several described torture, including forcibly removing teeth from one victim and placing a burning hot knife on another victim, then cutting him. Mr. President, Human Rights watch reports that “witnesses consistently identified the killers or abusers as Republican Forces” and that they were “overseen” by Ouattara and Guillaume Soro, now Ouattara’s Prime Minister and Defense Minister. The report has eye witness accounts of mid- and high-level commanders being at or near the place where the killings took place. This is something I have been demanding for seven weeks, Mr. President. I hope finally now that this report — along with an Amnesty International report released last week that found similar ongoing killings and looting in Abidjan by Ouattaran forces — will bring enough pressure to halt this ongoing bloodbath. Mr. President, I have been very critical of our State Department’s handling of this situation in Cote d’Ivoire from the beginning. I sent them evidence months ago that showed that Ouattara had engaged in massive election fraud during last year’s presidential election, and I called for an investigation, which the State Department ignored. I also called upon the State Department to inquire into the safety and health of President Laurent Gbagbo and his wife Simone. But to date, they have not shared any information about them with me. I am not sure they even know anything — which is very disturbing. Lastly, I had urged our State Department to use its power and influence to allow the reconciliation process in Cote d’Ivoire to begin by allowing the Gbagbos to go into exile. I pointed out that at least half the population of Cote d’Ivoire supports the Gbagbos, and I have knowledge of one African leader who is willing to give them asylum right now in his country. The State Department has been aware of this offer for over a month, and I again strongly suggest they examine this path to peace. The U.S. has performed such a role before in 1986, when, under the Reagan Administration, Haiti’s “Baby Doc” Duvalier was sent into exile in France. This could be an important step towards beginning this process of reconciliation in war-ravaged Cote d’Ivoire. Mr. President, I met privately with Under Secretary for Political Affairs Bill Burns yesterday in connection with his nomination to be the Deputy Secretary of State. I found him to be a knowledgeable public servant, and I will support his nomination. I am convinced Under Secretary Burns embodies the highest traditions of the Foreign Service – selfless, non-partisan diplomatic service – and he indicated to me that he will follow through on my previous requests with the State Department, and specifically regarding the health and well-being of the Gbagbos. I thank him for his concern, and am more hopeful that my calls for action will now receive the attention they deserve at the State Department, the United Nations and with the French government. Mr. President, the ongoing slaughter in Abidjan and Cote d’Ivoire generally must end now, and Ouattara and his forces held accountable. On the Senate floor, Inhofe decries President Obama meeting with war criminal and illegitimate leader of Cote d'Ivoire, Alassane Ouattara. Senator Inhofe makes yet another speech on the atrocities in Cote d'Ivoire and pleads with the United States government to take a position that can help end the fighting there. Senator Inhofe makes an opening statement during a Senate Foreign Relations hearing on Côte d'Ivoire. Gary Lane interviews missions Pastor Ted Jensen discussing Ivory Coast. Marie-Antoinette Singleton defends Gbagbo explains the election fraud and reveals current conditions in Côte d'Ivoire. CBN discusses the sudden, violent, and illegal seizure of power. Inhofe condemns the use of so-called "peacekeeping" forces made up of UN and French forces. A summary of the Presidential conflict. Through numerous attacks on the presidential palace in Abidjan, Gbagbo's daughter, Marie Singleton, says their faith remains strong. On Senate Floor Inhofe calls on UN and France to put a stop to death squads in Cote d'Ivoire. In a second speech U.S. Sen. Jim Inhofe continues to bring light to the atrocities occurring in Cote d'Ivoire. UN and French forces bomb the Presidential Residence in Cote d'Ivoire where many civilians were protecting Gbagbo only armed with baseball bats and clubs. 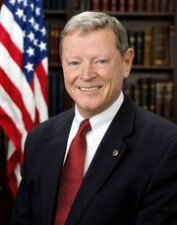 Inhofe's first speech on the Senate floor about the atrocities occurring in Cote d'Ivoire. contact@ivorycoastpresident.com ©2019 All Rights Reserved.